Russian President Vladimir Putin said at a meeting with German Chancellor Angela Merkel on Friday that he would stand up to any attempts by U.S. President Donald Trump to block a Russian-German gas pipeline project. 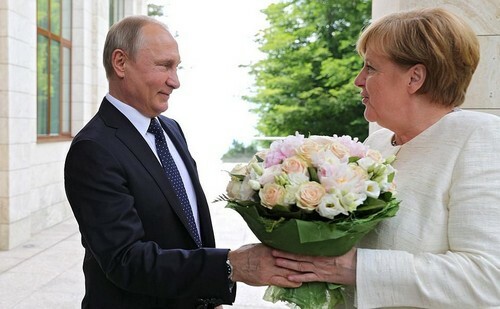 Berlin and Moscow have been at loggerheads since Russia’s annexation of Crimea four years ago, but they share a common interest in the Nordstream 2 pipeline project, which will allow Russia to export more natural gas to northern Europe. “Donald is not just the U.S. president, he’s also a good, tough entrepreneur,” Putin said at a news conference, alongside Merkel, after the two leaders had talks in the Russian Black Sea resort of Sochi. “He’s promoting the interests of his business, to ensure the sales of liquefied natural gas on the European market,” Putin said. “North Stream Two is important to Putin mainly as a symbol of Germany’s independence from the U.S.,” political analyst Vladimir Frolov said in comments to The Moscow Times. “The challenge for Putin will be to exploit the rift between Europe and Trump’s disruptive policies in the U.S. to extract meaningful concessions from Europe in exchange for providing solidarity on saving the Iran deal and undermining U.S. sanctions,” Frolov added. As well as the differences over Nordstream, European capitals are at odds with Washington over Trump’s decision to withdraw from the Iranian nuclear deal. Moscow shares Europe’s position on the deal. “Germany, Britain, France, and all our partners in the European Union continue to support this deal and remain in this deal and we know that a very specific situation arose that we Europeans need to discuss with Iran,” Merkel said at the news conference. “But this does not challenge the intensity of the transatlantic relationship,” she said. Some commentators have said that a shared opposition to Trump’s stances on Iran and other issues could lead to a rapprochement between Europe and Russia, repairing a relationship badly damaged by the Ukraine conflict. Putin’s remarks about Trump were unusually forthright. While the Russian leader is frequently critical of U.S. policy, Putin has always been respectful in his comments on Trump, with whom Kremlin officials say he has built up a personal rapport. That’s pretty stunning website I’ve got into, while was looking thru a web.